Below is the guide to make the custom configuration file. You are invited to tell us what you think about it and please have us informed whether anything needs to be modified. Thanks in advance! If you are using WDC9, and you set up Type=Custom, you will see it in here. The configuration file "UserCustom.ini" must be saved in the installation directory, then Wise Disk Cleaner can automatically adopts the configuration file. The section below from 1 to 6 are mandatory. The user must start from the 7th node and go on with 8, 9, etc. The first 6 are already in use. 2, Name= Name of the node. This is used to define following cleaning rules. It will not be displayed on WDC interface. Type can be defined as Trash or Trace. Trash: Trash accumulates the size of the files cleaned. If you define as Trash, this cleaning rules will be displayed in "Useless Files In Computer". Trace: Trace counts the quantity of items cleaned. If you define as Trace, this cleaning rules will be displayed in "Traces In Computer". A show name of the node. It will be displayed on WDC interface. The icon of this cleaning rule. The section below from 7 to 11 are to customize the cleaning rules. Notice: the content in "()" is optional, while the content in "" is required and mandatory. The name of one cleaning rule, serial number starts from 0 and has no upper limit. A show name of this cleaning rule. It will be displayed on WDC interface. It is used to determine whether the program needs cleaning is installed or not. If this item exists, then it will first determine whether the program needs cleaning is installed. If it’s not installed, then the rules will not be listed. If no need to determine this, this item is not needed to exist. Please notice that by “not exist” it means the whole item including the content left of the “=”. HKEY_CURRENT_USER\Software\Opera Software(reg) //To determine the value of the registry key. The mark (reg) needs to be placed at the end if the determine of registry key is used. The section below is to customize the items needed cleaning. It is to customize the items needed cleaning. This section varies in accordance with the Types section. Write in the paths needed scanning. Use semicolons ( to separate different paths, within which the environment variables supported can be included. Write in the registry path needed scanning. Semicolons are used to separate the paths. Write in the complete path of the database file. %LOCALAPPDATA%\Google\Chrome\User Data\Default\Cookies //Cookies here is a file without suffixes, not a directory. This section also varies in accordance with the Types section. Filter= Filter criteria, Wildcard is supported here. (e.g. *.dat). Semicolon is used to separate multiple criteria here. (e.g. Filter=*.txt;*.dat) This criterion is mandatory. 0: not to search in subdirectory. 0: not to delete subdirectory. Exclude=Exclusion criteria, to define the exclusion type. (e.g. *.dat) The exclusion file name can also be written in directly. Semicolon is used to separate multiple criteria here. Pathmatch= regular expression, use regular expressions to describe similar path. If is valid, then it will combine (Pathmatch) value to as full scanning path. RegExpr= regular expression, Use regular expressions to filter qualified keys. 0: not to search sub key. 0: not to display the value under the key specified. 0: not to delete itself. The same like File above. 1. All the regular system environment variables. e.g. %appdate%, %windir%, %systemroot%, %programfiles%, %userprofile% etc..
2. Extensional environment variables, which are customized by Wise Disk Cleaner. %INTERNET_CACHE%: Directory to save IEcaches. %FAVORITES%: Where IE Favourites are saved. Preferably step by step instructions! I installed WDC 8.0.2.572 and I've tried to make usercustom.ini (I'm using windows 8.1). 1, About the custom settings was gray. You can translate text after symbol ' = ' to Italian, then save file. 3, Sorry, I don't find out this problem. Please try again. This customization technique via an ini file is not suited for most users. Moreover, it could lead to a disater for those untrained individuals who attempt to deploy it. This is definitely a step in the wrong direction IMHO. Moreover, this ini file will require continual updating based on the installed program changes. For example, what happens if a specific program provides a major update and moves things around? If so, how is one supposed to know how to tailor this new ini file to clean the new locations properly? Now, since there are already programs that attempt such remedial actions, and since they only require a checkbox to be ticked, I would say they are well ahead of this ini initiative; however, even those programs fail frequently because it is difficult to keep up with all the popular program rewrites and updates. I have used CCxxxxxxx in the past and it has continually broken unique programs due to specific programs being updated and the cleaner program lagging behind (or not knowing about) the updated program locations. Now, if programmers can't keep up with the changes, do you think the average user will succeed? Again, this is not a good idea IMHO. Maybe doesn't it work just after the creation? As demonstrated by your own skilled testing, this beta is not for the untrained and/or faint of heart. Now, I normally don't make such profound statements but I think this beta really needs to remain a beta for quite a while because I think its introduction into the GA release would turn an already stable product into an unsafe nightmare for most of us. I have always touted the Wise Product Line as being the best in the areas of safety and reliability; however, if this goes GA, I will no longer be able to make such statements going forward. For the life of me, I don't understand why the Wise Development Team would ever introduce such a difficult option that is extremely dangerous (in untrained hands). Moreover, I just talked to Santa and he doesn't like the idea either! Normal users can continue to use the program like always: it is not mandatory for anyone customize it. The option to use it or not was quite clear from the beginning; however, my fear is that many incapable users will attempt to use it and fail miserably. You know the old saying "it was curiosity that killed the cat?" Well, that saying certainly applies here. And in the worse case scenario, the uninformed / untrained (?unwashed?) can always uninstall the program and then reinstall a correctly working copy. So what's not to like about having options? This isn't life and death after all. 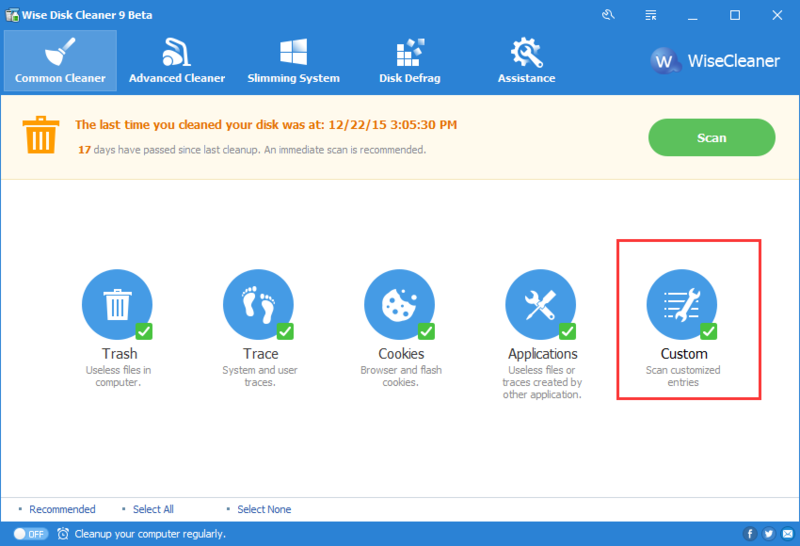 Wise Disk Cleaner 8.0 Custom Configuration is just for Advanced users. We don't recommended basic users to try this. If you really want to try this function, please make a system restore point, or backup system, then try this function. 1) Open notepad.exe and save the file as UserCustom.ini (uppercase or lowercase doesn't matter). The file could be saved with ANSI or unicode encodings (it seems it doesn't matter, but I'm using the simple latin alphabet). The codes/lines under [Root7] will create a new section (or node) named wc365, it will be under the trash useless files in computer, the name displayed will be Wise Care ThreeHundredSixtyFive and it will use the internet icon (the globe). The codes/lines under [wc3650], that is derived from the Name under the new root, will create the cleaning rules. In this case, the first rule is [wc3650]... There aren't other rules, but the second would be [wc3651], the third [wc3652], and so forth. The name of the cleaning rule will be Delete zip files. The recommended line will have effect when you click the recommended link in the common cleaner at bottom-left corner. 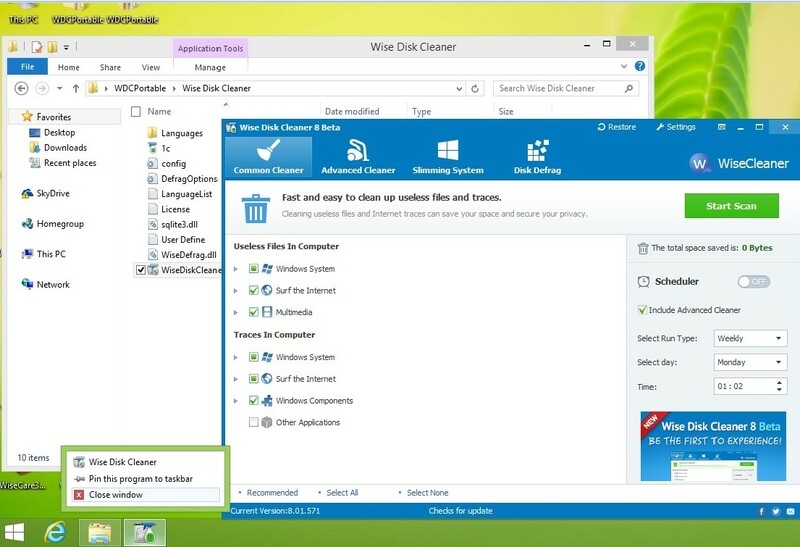 Item0 will search *.zip, the third parameter, File(s), the first parameter, inside the folder %USERPROFILE%\Desktop\Applicazioni\Programmi portable di WISE CLEANER\Wise Care 365, the second parameter. 3) Finally, save the file (again) and close it. Because if I modify only the italian file, when I'll switch to english the rules will remain with the italian name. Your description of a worse-case-scenario is not accurate; in that, a worst-case-scenario would actually be where one configures the options to clean an area that should not be cleaned and destroys the operating system; thereby, necessitating a complete reinstall of the OS and an uninstall and reinstall of this program will not fix the damage done. Agreed! Only for very advanced users; period! In fact, this is one of the most complexed options I've ever encountered! Hi Xixolee! Glad you finally figured it out and thanks for sharing your success. Again, all your efforts seem to indicate this optional feature should not be used by anyone other than an advanced user IMHO. Well, I don't think to be a (very) advanced user... Without using the TranName and the Language files, the task is (quite) easy (for an intermediate user at least, not for a beginner). I personally consider you to be an advanced user and the fact that it took you a few tries to figure it out clearly indicates this should not be attempted by all. My response to the above is: Yes, after you put forth some time and effort to figure it out. IMHO, I just feel it is important to emphasize that one could get into trouble if they don't know what they are doing with this option and I'll leave it at that. I found that the usercustom.ini works also in wise care 365!!! I found two problems with the custom configuration. The wildcard * isn't accepted inside a path. The (Exclude=____) option is actually excluding everything in a section. The first item should find all log or log. * or *.log files in %LocalAppData%\Google\Chrome folder, the second item should exclude the unique LOG file present in %LocalAppData%\Google\Chrome\User Data\Default\GCM Store (because I don't like to see it twice). When I use the exclude option, there are five results missing (instead of one, the doublet). When I don't use the exclude option, those files appear, but the doublet also appears. The exclude option issue, we will check it. I saw another item in the Vivaldi example by 云淡风轻 (Clear Sky? ): PathMatch. Could it be added to the guide (with basic explanation and examples)? I already add the explanation for Pathmatch, in Filters and Option section. please check it.